One year in, and Big Al's has turned in to one of the Puget Sound's most impressive, benchmark setting breweries. In addition to the flagship beers: Abbey Wheat, and Irish Red, Al whips up a constantly changing, always impressive lineup of one-offs, seasonals, and "just because" beers. Standouts so far have been the 5 Star Chili Ale, and the Vienna Lager. 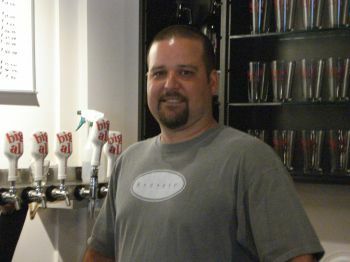 Al also has quarterly homebrew recipes he showcases on his "Local Hero" tap. The methods he uses to choose these recipes varies, but it's a great way to showcase the talent of our local homebrewing community. Props to him for paying tribute to his roots. If you're in the area, or travelling here; Big Al's must be in your "top 3 breweries" to go see. At the very least, order a pint when you see Big Al's on tap at one of our local bars! Big Al Brewing out in the West Seattle suburbs is just what the doctor ordered. 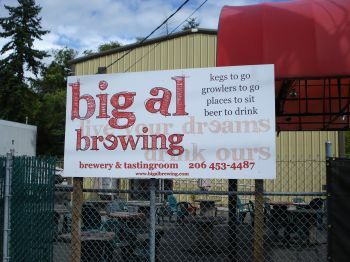 Big Al Brewing is a huge breath of fresh air the Pac NW beer scene is looking for. Al and I talked for a few hours talking - beer, brewing and the beer business. It was awesome. Oh donâ€™t forget all during which I was also sampling some great beers. Started out with a great Belgium and finished with a thick one time only brew (Lil Al 80 Series Stout). This is a brew they are experimenting with and only do a one time only batch on the smaller barrel system they have set up. Now if the Lil Al brew goes over well that beer then will become a beer they will brew on the large system. So from the start the 5 main brews on tap where just awesome. Loved the Smoked Porter which is the newest of the beers they had just put out. Wow the smokiness was just perfect. So after trying all the beers it was time for the tour. Al took me all over the brewery showing me everything. This was a great time. Al really loves what he does and the saying at Big Al Brewing â€“ â€œLive your dreams, drink ours.â€ This is truly a great motto. A must stop for all beer enthusiasts in the Pac NW. They have a great tap room set up and the prices are very reasonable. They also have WiFi and if you bring your lunch or dinner you are set. I will be back for sure. Take a growler home I sure wish I had. Sounds a bit naughty, doesn't it? Like something from the Roaring Twenties where a single eye looks over each wanna-be patron through a small, wooden slat from the other side of a door, asking for a password. "Big Al sent me!" - and the slat closes, the door opens & you're thrust into a room full of noisy revelers; drinking, dancing on tables with flappers galore twisting their fringe-covered skirts and polished, patent leathers to the beat of a 5-piece swing band. This Big Al's is a tasting room...the dream of Alejandro Brown -- a hobby brewer that mutated into a business. 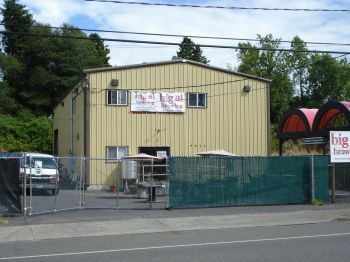 Located in the defunct Pacific Rim building, Big Al swept in when they closed their doors, bought the locks, the stocks, the barrels and the brewing equipment and went to work. Wife Persimmon and I visited on their 3rd day of business after a grand Thursday night opening attended by members of the Washington Beer Lovers or WABL. The place was deserted but then we arrived as soon as the wooden slat was movable. Big Al talked about his plans to brew "whatever he wants" -- different seasonals, try new receipes, throw unique items into batches to experiment - anything to set his beers apart from the rest. His excitement about the prospect was infectious. In the meantime, we tried his flagship beer, Abbey Wheat, a hefe wanna-be with an orange-red color and clean, crisp taste; and the Irish Red, not like any red or amber beer I've tasted, full of malts and caramel that sits on the palate and throat more like a Scotch ale...and that was just fine with us. "Farmers make wine," said Jerome, Big Al's brewing partner, "engineers make beer." One brewery closes, another opens up...hop prices are coming down...and we here in the Evergreen State command a large market share nation-wide of craft beer sold...and by the time we left, 3 other fellow travelers had sat at the bar for a pint. Big Al and his engineer friends are doing something very right. Now, if he can just bring in the flappers, the band, and that door with the wooden slat!